Buckingham Palace had a regular contingent of police officers posted to it from ‘A’ Division’s Cannon Row Police Station. To assist them at the outbreak of the war Wellington Arch (AW) had an increase in staff to cover a new shift of night duty and to supply casual aid to the Palace. It is hard to believe that the Arch was not only a full time Police Station but a Section House with fourteen single regulars living in it. Living in the Arch was not easy, although they had a lady cook lunch each day; little was forthcoming due to rationing. Evening meals were often taken at Hyde Park Police Station. The aid to the Palace was meant to be on a casual basis but most officers found themselves there every other week, being posted to the important posts (as defined by the regulars) such as the garden patrols or even the Electricians Gate. Night duty garden patrols were detested by most because during the air raids they felt isolated and vulnerable with very rare visits from supervising officers or anyone else during the eight hour duty. Posts such as the Forecourt and Arches were nearly always done by the regulars. 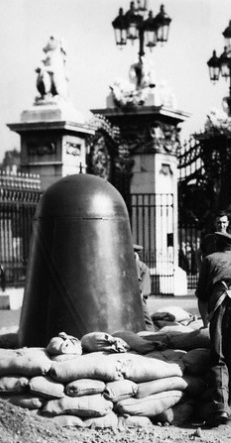 Most, if not all posts, were issued with a steel ‘Bell’ shelter for use during air raids. I believe No.1 beat’s shelter was sited just inside the garden next to the Garden Gate. (See photo below) Instructions were given that officers should take shelter during raids and that incendiary bombs were to be left alone if not causing immediate danger to the Palace. In September 1940, at the beginning of the ‘blitz’, the Palace was attacked on three occasions. The first, on the night of the 9th, left an unexploded 250lb bomb near the swimming pool. On the 10th it exploded, damaging the pool which had only been built two years earlier for the two Princesses, over 100 windows were smashed and Wellington Arch was shaken. The second attack on the 13th left the Chapel in ruins; the Quadrangle was also hit two days later, the original date Hitler had wanted the invasion of England to begin, a bomb went through the Palace roof and all the way to the basement, exploding in the plumber’s shop killing a plumber, Joe Davies, and injuring two others. It narrowly missed the room the King and Queen were in. The 1st of October saw the next attack when the lawn and west front were hit. It was during one of these attacks, I have been told, that an elderly Special on 1 beat had taken to his ‘Bell’ shelter. As bombs rained down shaking the ground around him the Duty Officer, Inspector Bill Hill, called him from the depths of the Palace to inquire as to where the bombs were falling. The reply was short... 'If you want to know that, come up and bloody look yourself’. He didn’t. The King and Queen surveying the bomb damage caused to the swimming pool corner, Sept. 1940. Notice at the bottom of the distant columns on the left, just under the elbow of the man standing, the top of a domed Bell shelter. This is the location of the Garden Gate.